I once read a book that was titled “You Can’t Steal Second With Your Foot On First”. It was given to me by a mentor that wanted me to think about taking a risk. As a baseball fan, it was a simple illustration to understand. 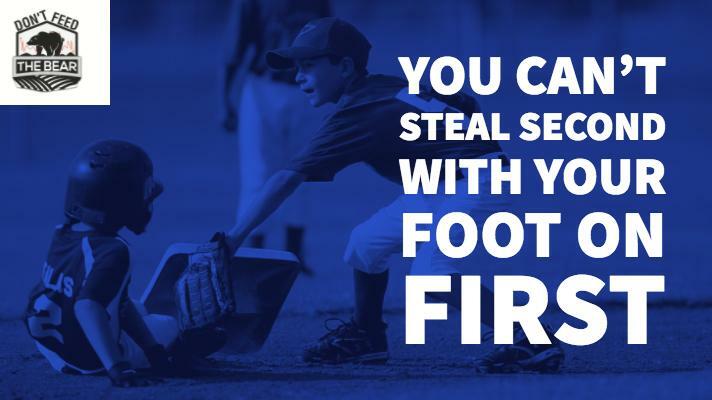 In baseball, in order to steal second base, the runner needs to take a lead. The further off you get from the bag, the more risk you take that you may get picked off. But, the further you step off and get to second base, the greater chance that you are able to steal successfully. You have to decide how much risk you need to take. We encounter risk in many areas of our lives and it is very important to understand the relationship between risk and reward. There is a direct correlation between risk and reward. The reward needs to be worth the risk, however the motivation behind the desired reward is not always the same. Whether it is asking out a crush, trying out for a play or a sports team, or investing your savings to have a better chance of achieving a financial goal, there is an element of risk that needs to be taken. For some, the risk is greater than the desired reward. For others, the risk is worth the reward. In order to decide how much risk to take it is very important to determine if the reward is worth the risk taken. If you need to get into scoring position to help your team tie or win a game, they may need you to get a bigger lead. But if you are up 8 runs in the 8th inning, there is less of a reward for the risk taken. More than likely you will need to take a bigger lead in the first scenario, but in the second scenario the need to steal second is not necessary. We see this with clients when it comes to accomplishing long-term goals. When you are on track for your goals, it may be wiser to reduce your risk so that you can stay on track. Each person has risk in many areas of their lives, whether it exists because of the decisions they make or because it is there intrinsically. An example of that is the risk of losing money investing. If you invest in the stock market, you could lose money. If you keep your money in cash, inflation causes your money to be worth less over time. With the stock market, you could see your money go down, but in cash, you may be taking more risk of not accomplishing your goals than if you invest in a diversified portfolio. As financial advisors, we understand that everyone has different goals. After goals are identified we help clients manage the risk that they need to take in order to have a better chance to achieve them. Risk management always starts with identifying the goal, the path to getting to the goal, and then the amount of risk that is appropriate to accept to get there. If you have any questions about how much risk you have, we are happy to talk with you about this. At the end of the day, there are some people that need to steal second base, and we can help to show you how much of a lead you need to get off of the base to have a better chance of getting there!